PV Power has started operating its wind farm on southern Binh Thuan province’s Phu Quy Island, advancing the opportunity for exploiting the renewable energy potential to spur the island’s economic growth. The $17 million Phu Quy wind farm, which is invested by PetroVietnam Power Renewable Energy Limited Company (PV Power RE) under PV Power, will has three turbines with the combined capacity of 6 megawatts (MW). When operational, the new wind farm is scheduled to supply 25.4 million kilowatt hour (Kwh) each year, meeting the electricity demand of Phu Quy commune. Nguyen Duc Hoa, administrative chief of Binh Thuan Provincial People’s Committee, said that Phu Quy wind farm would help develop the local economy. Because Phu Quy island is located 60 sea miles far away from the mainland, Hoa explained, connecting the national power grids to the island is not feasible. 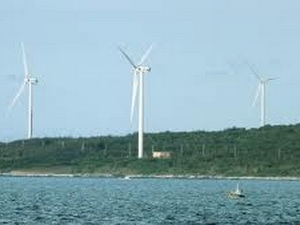 In the past, Phu Quy island was totally supplied with electricity from diesel source whose prices have been on the rise by Binh Thuan Power Corporation under state-run Electricity of Vietnam’s (EVN) Southern Power Corporation. Specifically, the power tariff in the island is VND2,40–3,200/kWh (11.5-15.3 UScents), almost doubling the current level in the mainland. Expensive power tariff in the island even forced some local seafood processing factories to shut down. “The power supply in Phu Quy island used to last 16 hours per day. Now, Phu Quy wind farm is expected to supply islanders with electricity around the day, helping to improve their living conditions,” said Hoa. According to Binh Thuan’s authorities, the province is now home to 16 wind power projects with the combined capacity of 1,300MW. Located in a subtropical zone with a long coastline, Vietnam is said to have great advantages for developing wind power. Therefore, the Vietnamese government is boosting investments in developing wind power to replace exhaustible fossil fuels and protect the environment. According to a World Bank survey, under the Asia Sustainable and Alternative Energy programme, 8.6 per cent of Vietnam’s areas is considered having potential for wind power development, mainly in central, central highlands and southeastern provinces. According to the Ministry of Industry and Trade, many foreign investors such as Belgium’s Enfinity, German Donier Aircraft Leasing Limited, Swiss Aero.Plus Company, Norway’s SN power and German Fuhrlaender AG among others, are working on wind power projects in Vietnam.